GREAT! Yesterday nite was my very first time enjoying hard rock music! I actually had not really serious intention to watch the festival. I just wanted to invite my friends: Dorina, Sina, and Matias who come from Germany, to watch BHRF XIV. I planned myself to pick them up to Borneo Tribune office with my friends, then carried them up to the venue of BHRF. But the schedule was changed since Dorina sent me sms, told me that they were gonna have a meeting, and then they would go to Auditorium Untan straight away after the meeting. Thanks God, I said in heart. I was really exhausted, so much tired yesterday since I just had less than 3 hours sleeping to conduct another event which my lecture *Mr. Albert Rufinus, who is now my Supervisor of my thesis* believed me to handle: Akeelah and the Bee, Book Launch and Spelling Bee Competition. But that nite was so wonderful. 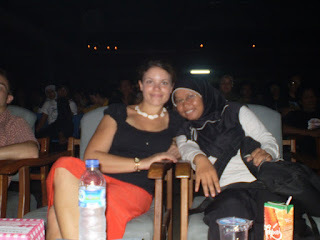 Besides accompanying Dorina, Sina, and Matias, and also Kak Dwi from Borneo Tribune, I had my memory back in BHRF last nite. When I was the first semester student of English Study Program in Tanjungpura University, I was requested to be the MC of BHRF 2005. I, surely, then accepted the offering from my senior, bang Tan Hardimansyah. Sincerely being the MC at that moment, but really I couldn’t enjoy the hard rock music as much as I enjoyed it last nite! Yesterday was my very first time to enjoy the music after seeing the second contestant showed their performance! One thing that I really wonder is: the voice of the hard rock band vocalist. It seems that most of them have almost the same character of voice. They have good voice(s? ), and I think their ways in screaming *maybe not scream, but since the genre of music that they sing is hard rock so I think they are screaming* is really same which makes me think: their voice is equal. Sure, theirs are not. The other thing that I also just knew is the way for enjoying hard rock music. I knew it from my new friend, Bang Abun. He sat besides me, then we made friend at that very nice moment last nite. I was curious why he closed his ears when watching one of the finalists performed. He explained me that it is the way to enjoy every single harmony of the music: how the bass is played, how the guitarist explore the instrument, as well the pronunciation of the vocalist. I got one new friend and a little musical information which I had no idea before, last nite! Really wonderful Saturday nite :).